There's nothing as enjoyable as a weekend away with your favourite girlfriends and where else has the party vibe and beauty of Ibiza? A trip to the White Isle with your BFFs (best female friends) could be just what you need to unwind and have some fun. Ibiza has lots to offer from gorgeous beaches and beach clubs, chi chi hotels, great places to eat and of course its world-famous parties. Sometimes you want to treat yourself to some luxury and splash the cash in all the right places, so we've laid out some of the top ways to do that. Look out for part two of this article series, when we'll be covering how to do a girls' Ibiza getaway on a budget. Here is a selection of our top picks for a spoiling yourself mini-break on Ibiza. Girls, get ready! If you are on a budget, there are still plenty of things to do. Read our sister article How to do the perfect girls' budget trip to Ibiza. Fortunately, on Ibiza there are plenty of luscious locations for pure relaxation and absolute bliss. In Playa d'en Bossa, with a sea view to die for, is the Torre Del Mar hotel. Its rooftop suites offer the pleasure of sliding into your own private-terrace jacuzzi. Nearby are the cool Santos Ibiza Suites, where you can grab a large "Dream Bed" and get a massage or beauty treatment. With a top concierge service - all your needs are taken care of. A great beachside spot next what is probably Ibiza's hippest beach, is Boutique Hostal Las Salinas. The location could not be more perfect. There's an on-site restaurant, regular DJs and a great bar. You are close to famous beach bars like the Jockey Club too. Decorated with pale pink and lavender tones and brightly coloured retro-style furniture, The Paradiso Ibiza Art Hotel, new this year, is proving highly popular. With original art and a cocktail bar in each room, this San Antonio Bay hotel is the perfect launchpad for your girls' trip. Across the bay in San Antonio is the Wi-Ki-Woo hotel, where the quirky art-deco design and pink and mint green colour palate make a great girls' chill place. Close to the Sunset Strip and boasting its own restaurant and excellent bar, pre-party options are aplenty. 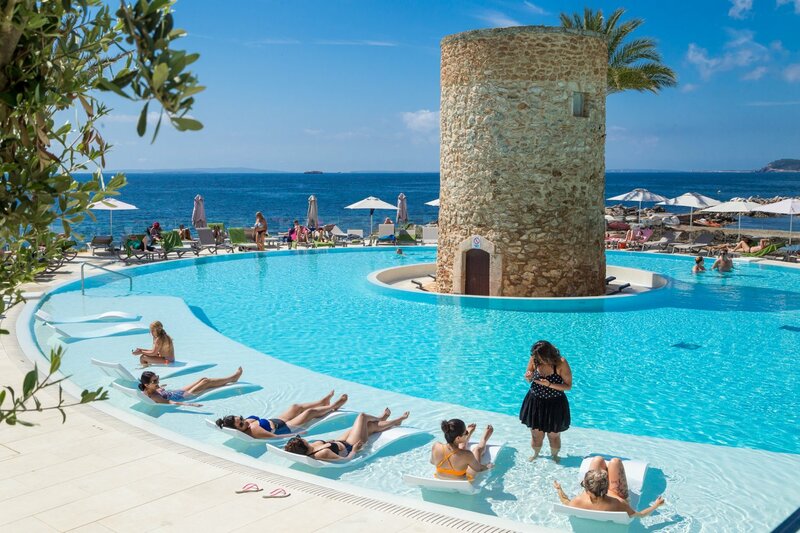 More affordable is San Antonio's Ibiza Rocks Hotel or Ibiza Rocks Budget Apartments, where you can have more control over how pricey your stay is. Cool and stylish, there's two sun-soaked swimming pools, multiple bars and restaurants there too. Having drinks in a luxury beachside venue is a gret way to spend a day. Head north to the glamorous beach club Nikki Beach for a perfect daytime fiesta with a great selection of music. Girls run the world at Ladies' Day on Tuesdays, where for a very reasonable sum, you can get a double beach bed, nibbles and unlimited mojitos and Cava. Oh yes! Over in Playa d'en Bossa you can go for the chilled vibes of Tanit Beach Ibiza or go decidely up-tempo at Nassau Beach Club and both are right next to the sea. Ideal for sun-soaked days of relaxation with food and cocktails served direct to your beach bed. Both have lovely boutiques too. Eat and drink with your feet in the sand on Playa Pinet at Reggae Reggae Beach bar. This hidden treasure resembles a beach in the Caribbean with a small Jamaican cocktail bar serving high standard, refreshing cocktails at cheap prices. Or, on the same beach try Imagine for a superb fresh mojito that's really affordable. A great day out on the water is pure bliss. Chartering a luxury boat to see great sights, top up your tan on the deck or swim in the sea is great fun. Add in some great tunes and drinks with all the heavy lifting done for you and you have a fantastic day of relaxing. A day on stunning Formentera is within everyone's reach with Aquabus, going from Ibiza Town. With a same day return tickets from a touch under €20 and free bike hire included, it's a fantastic way to save money for those more expensive holiday items. A trip to one of the hippy markets of Las Dalias or Punta Arabí to pick up some handmade jewellery, leather goods or some hippy-chic clothing is a treat. There are some great boutiques all over the island, especially in Ibiza old town and in Santa Gertrudis, where you will find some great clothing that's very Ibiza. Getting yourselves a nice gift is easy on this island. If you're looking for some cute, small souvenirs, then there are numerous street markets most days of the week, that offer some reasonably priced items also. Playa 'd'en Bossa has one as do Ibiza Town and San Antonio. There are often more inexpensive finds to be had on these smaller markets too. Eating out in a great restaurant is essential and there is a huge selection of great places to eat. For a five-star experience, try the fine-dining Sa Punta restaurant with incredible sunset views of Dalt Vila, the walled citadel of Ibiza Town. If that's not your thing, then within the same complex are two other restaurants with the fresh Asian food of Ginger or Lebanese at Patchwork. For dressing up and stepping into French-style glamour, try La Imprenta in Ibiza Town where dining is theatre, literally since there's a nightly Burlesque-style cabaret show during summer. A firm favourite for discerning diners in Dalt Vila on the cobbled streets is the multi-site La Dispensa. Aiyanna Ibiza in Cala Nova Bay combines fresh food with Boho chic and amazing sea views. Japanese food fans will love Nagai Ibiza in Santa Eulalia where the cuisine is blended with Italian and Thai influences, there's even a chic boutique. Back in Ibiza Town, more Japanese fusion at glamourous Zela awaits with flavours of the Med combined with its high quality fare. More affrodable in San Antonio is the very popular restaurant, Tapas known for its fairy-light adorned terrace and cool ambience. It offers a more modern take on Tapas, with the chorizo in Hoisin sauce and the stuffed mushrooms with three cheeses particularly good. Included in your mini-break should be a sample of one of Ibiza's parties for some true hedonistic fun. Open-air daytime parties like Ushuaïa are perfect for grooving by the pool and for something more wild try Ocean Beach or Zoo Project where before you go, you can even get your body painted or glittered up courtesy of Kiss My Fairy in San Antonio. Want to get dressed up to the nines? On the sumptuous end of the spectrum is Pacha, an icon of the island with a cool updated look for 2018 as well as a new elegant rooftop terrace. If you want a wild confetti fiesta like no other, then make your way to elrow at Amnesia or listen to some great old-school tunes at Glitterbox. If you feel like straying away from techno, SWAG offers urban music combined with trap and rhyme. “Good girls go to heaven - bad girls go everywhere”, is SWAG's ladies night on Wednesdays. Groups of five girls can enjoy a free bottle of champagne when arriving before 01:00 – fantastic! If you have your heart set on seeing a particular DJ then check out our party calendar with all the line-ups and dates you need for your pefect party night out. So, there you have it, a great selection of things to do for just you and the girls. Pack your best beachwear and night outfits and have the best Ibiza blast ever.